While I have previously introduced you to HiFiKiddo, the social network for families and kids, and I have shared how HiFiKiddo works to keep kids safe online, I have not yet shared how kids can use HiFiKiddo to connect with others. 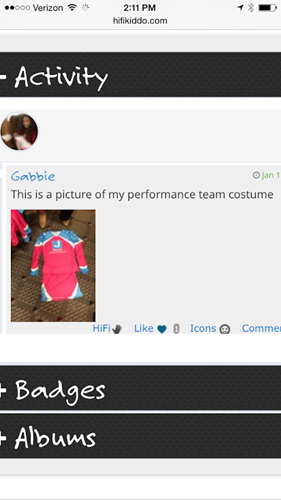 For this, I’m calling upon Gabbie to show you what she decided to share on her HiFiKiddo profile page! As you can see, she added her picture to her profile, choosing one of her holding her baby cousin. Then, she shared the photo of her costume for her dance Performance Team. As a parent, I find her choice to share a picture of her costume to be an appropriate use of social media! She would love to share this with her friends and family near and far. Like I mentioned previously, if your children are like mine and are interested in socializing online, I would recommend HiFiKiddo as a great place to start! Once again, if you do this, please let me know so that Gabbie and I can connect with you and your child! I am a brand ambassador for HiFiKiddo and have been sharing about this family friendly social network over the past few weeks. Thank you to HiFiKiddo for sponsoring this post! As always, all opinions are my own. Previous Post Scandal Sunday 4.11–Where’s The Black Lady?